Home > Services > Articles & White Papers > Can a for-profit brand act like a nonprofit and succeed? It isn’t easy. Can a for-profit brand act like a nonprofit and succeed? It isn’t easy. You would be hard-pressed to find an established company that doesn’t give back in some form or another. At the very least, most donate to charities, run ads in programs for local high school sports or donate time to community events. But 99 percent of the time, it’s business as usual and their customers have little or no awareness of what those companies do to support charitable efforts. But at the other end of the spectrum are for-profit brands that have built charitable giving or social responsibility into the core of their business concept. These brands make specific and measurable contributions to their chosen areas of need and by doing so invite their customers to share in the sense of having done some good in the world. These companies are likely to wear their mission on their sleeves, their marketing and branding loudly drawing attention to their mission and using it to build the brand and their business. The Toms company has become a leader in social responsibility brands. Formed in 2006, the home page of the Toms website states their case early and often: “With every product you purchase, Toms will help a person in need. One for One®” That trademarked phrase describes their eloquently simple business model in just three words, which for a brand concept is 24-carat gold. It’s easy to understand, it’s memorable, and Toms owns it. 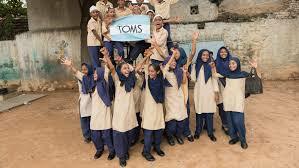 Toms started its venture by donating a pair of shoes for every pair they sold for a profit to a customer. Their success with that concept has allowed them to branch into other product lines such as sunglasses and apparel. The One for One mantra has been interpreted to include providing vision services, birth kits, clean water, and anti-bullying initiatives as well. Their website makes clear statements about how they help and who they help. Often referred to as the “Toms Model,” other brands have employed a similar approach, including Warby Parker, Good Spread, and Smile Squared. Each of these companies provides tangible goods and services based on the purchases of their customers. The customers in turn receive an intangible self-esteem boost for having helped people by choosing these brands over others. Of course, no good deed goes unpunished. Toms and other brands have been criticized for treating the symptoms, but not the causes, of the issues they seek to address. Detractors have also accused them of exploiting impoverished people in their marketing in order to make a profit. Which raises the critical question: Can a single brand faithfully serve both a for-profit business model and a charitable mission at the same time? In 2012, after just six years in existence, Toms had given away more than a million pairs of shoes in several different countries. That would appear to be a significant contribution to helping others, while also building its business. Ultimately, the customers of these brands are the final arbiters of the sincerity of the brands’ missions. Any of their customers could make a donation directly to a charity of their choice instead. They could buy their shoes or glasses or peanut butter from corporate giants with vaguely stated or nonexistent social responsibility values. Put another way: If there were more brands like Toms, would the world be a better place? For Toms customers at least, the answer is yes.